Dangers of Australian Bible Society (Part 2): Producing problems for the sheep. In part 2, we highlighted the fact that the Bible Society owns Koorong. 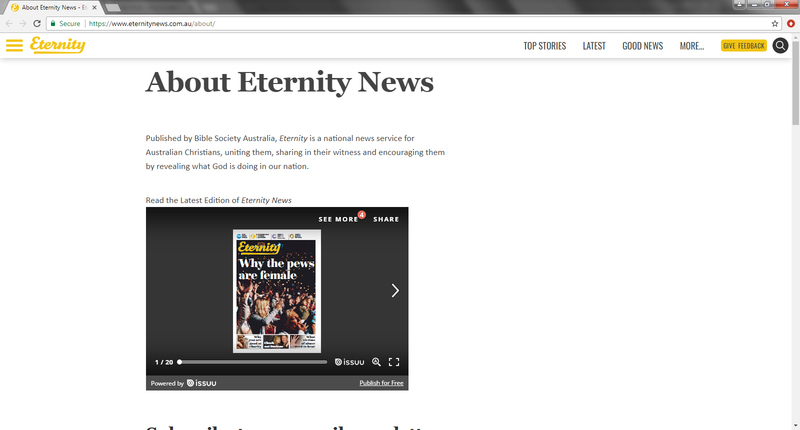 In this article, we also highlight the fact that Eternity news is PRODUCED by the Bible Society. The BS group at the bottom of their BS website. So why does Eternity News exist? Source: About Eternity News, Eternity News, https://www.eternitynews.com.au/about/, Accessed 25/08/2017. The basic question has to be asked: Does the Bible Society or Koorong truly care about the bible or the Christian Faith? Eternity News appears to reflect the Bible Society’s CEO’s views. So it should come as no surprise that Eternity News does not provide a proper news service to the Christian church in Australia. And from information we have gathered, Eternity News is familiar with the New Apostolic Reformation (NAR). We already know that the Bible Society has no problem pushing the agenda of the New Apostolic Reformation cults such as Hillsong or Bethel. So they are not uniting Christianity – it’s a form of propaganda to introduce Christians in Australia to the biggest global cult today – so we can say Eternity News is dividing Christian churches. They are not a Christian witness when they have become a voice for some of the most dangerous leaders in the NAR. So one has to question what on earth are they are actually doing – just what are they revealing God is doing across Australia? Eternity News do have occasional articles by a theologian or pastor to give the impression to their readers that they are about Christian issues. However, the true Christian standard of journalism fails to rise to the surface when they continually give a platform to NAR cult leaders or liberal voices in Eternity News. Unfortunately, this means Eternity News is nothing more than a ‘gagrag’. And sadly, it is distributed to many un-discerning churches across Australia. The person who founded Eternity News gagrag is John Sandeman. We need to highlight the fact that Sandeman’s low view of scripture allows these dangerous cult leaders to operate within the Christian community. In the article below, Sandeman attempted to correct Tanya Levin (through analogy) publicly in an open letter. His abysmal letter backfired when Tanya Levin responded with a biblical case for her views. It’s a shocking scenario when Sandeman can write an open letter on the Bible Society website defending a place like Hillsong by attacking an ex-member through analogy, only to be refuted and confronted with his inability to take the bible seriously about fraudulent organizations like Hillsong who hide their real agenda. Bible Society Australia wants Christians across Australia to read the Bible, talk about the Bible and learn from what others are doing in their Christian life. We’re now publishing a Christian newspaper, magazine and online news hub that give Christians a better idea of how Christianity and the Bible is being lived out both in Australia and around the world. 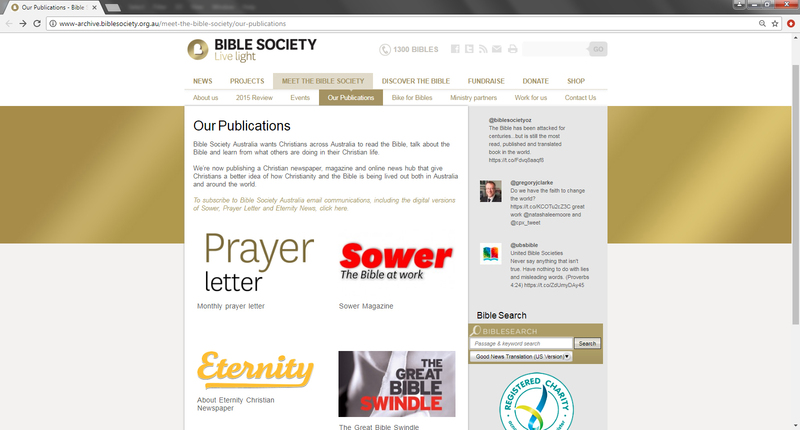 To subscribe to Bible Society Australia email communications, including the digital versions of Sower, Prayer Letter and Eternity News, click here. Source: The Bible Society, http://www-archive.biblesociety.org.au/meet-the-bible-society/our-publications, Accessed 26/08/2017. ‹ Resource: Enemies of the Cross.